1. I trap your little critters that make their way inside, and show the boys my respect for all living things side by side. 2. I compost. I have to take the compost to the giant bins next to our school garden, because I live in the city, and don’t have a yard. It’s a nuisance, but since we reap the rewards of the vegetables grown in that garden, well worth the effort. 3. We walk all the time. Living in the city certainly makes it possible to plan outings that don’t involve the car. 4. Reusable sandwich bags, and pyrex mini containers for our lunches. 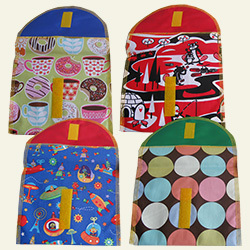 The material on the bags is eye candy for the kids, and they are durable and washable. 5. Give these lunch bags, mentioned above as gifts at birthday parties with a letter from Sammy inside saying how much he loves jelly. 6. We don’t eat meat at home. Don’t buy it. The primary reason, that we gave it up, over year ago, is because of all the resources involved in getting a chicken to the table.I have other reasons too, but for the purpose of Earth Day, I’ll leave it there for now. 7. Bring my own canvas or cloth bags everywhere now. Big “duh” for me was that, I can take them to hardware store, or the shoe store, or the Goodwill, or wherever we go that we usually end up with a bag. I had no idea how much petroleum is involved in making a plastic bag! 8. We plant our little urban and container garden together–edible and non. We water. We tend. We talk to the flowers, we thank the tomatoes. It gussies up our block, it makes our neighbors smile. I am passing on a love of all things dirt, and earth born to the kids. 9. We go to the farmers market-year round now. We walk there too. We eat the entire bag of the sweet yellow cherry toms before we get home. We bring a bag to pick up garbage in the park on the way home. It is a ritual. Ritual’s help. 10. I show my kids how happy I am when I am outside too. We take care of the things that bring us joy. Would love to hear what you and your family do to take care of the Mama of all Mamas where you live! 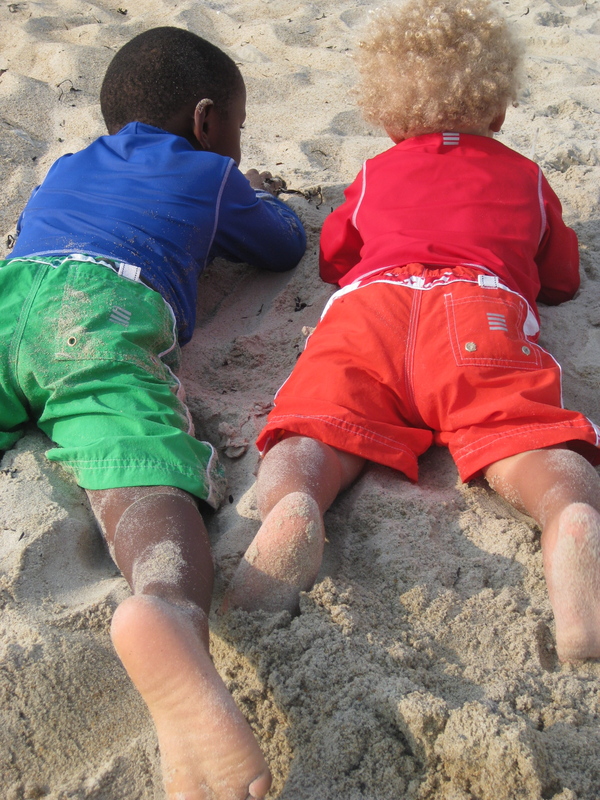 To our grandchildren’s grandchildren, being able to share the earth too. I need to get on the ball. I want to be more green, teach the girls and all, but so far haven’t made the time. Thanks for the motivation. I am pleased to consider myself as a motivation in this department! You motivate me in many ways as well. Thanks for the comment. I dig how you embrace your single mama-ness in all these celebratory ways!! Keep us posted on the garden’s success. The local squirrel population denuded our first attempt at planting peas! Your blog is great BTW. Nice to have you here at Mama C.
What a delightful, practical, do-able list. I thought you’d appreciate it, and it seems appropriate here because of her reflections on her connection to the land, to the natural world, to chickens. It’s a wide-ranging exploration of where she is now, as a writer, but more as a soul with other souls on this Earth, longing for peace and justice. thank you Annie. The article sounds like a very appropriate addition here! I look forward to it–as I have only ever been dazzled by Alice Walker of course. Love the list. Stay low to the ground. For me nature is everything, and I can see how Theo loves being outside; it calms him immediately. The other day, he was standing on the back deck flapping his arms and staring at an in-bloom apple tree, totally mesmerized.